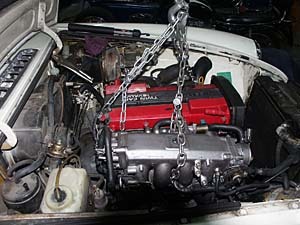 We put a Nissan CA18DET (from a Nissan 180sx) into a latter model MGB. We put a Toyota 2JZGTE (from Toyota Supra) into a Jaguar MKII. 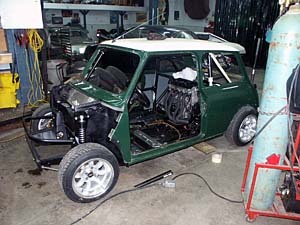 Suzuki Hayabusa engine conversion into a classic Mini. Sometimes, you want to keep the look or feeling of a classic chassis, but want a lot more performance than even a full race modification of original engines and components can give... reliably. If so, it could be time for a major engine swap, modifications, and fabrications. 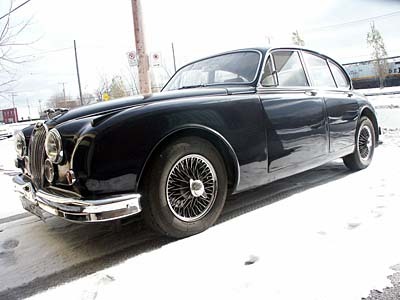 Complete engine and transmission swaps give significant improvement of power and reliability to old cars. Often modern larger displacement aluminium engines weigh less than the smaller iron casting original engines, giving better weight distribution, more power, and with modern fuel injection and electronic ignition, even can be cleaner and less harmful to the environment. TR7 to Nissan VG30DE (from Nissan 300ZX) conversion. Finally, something to make this car fun!